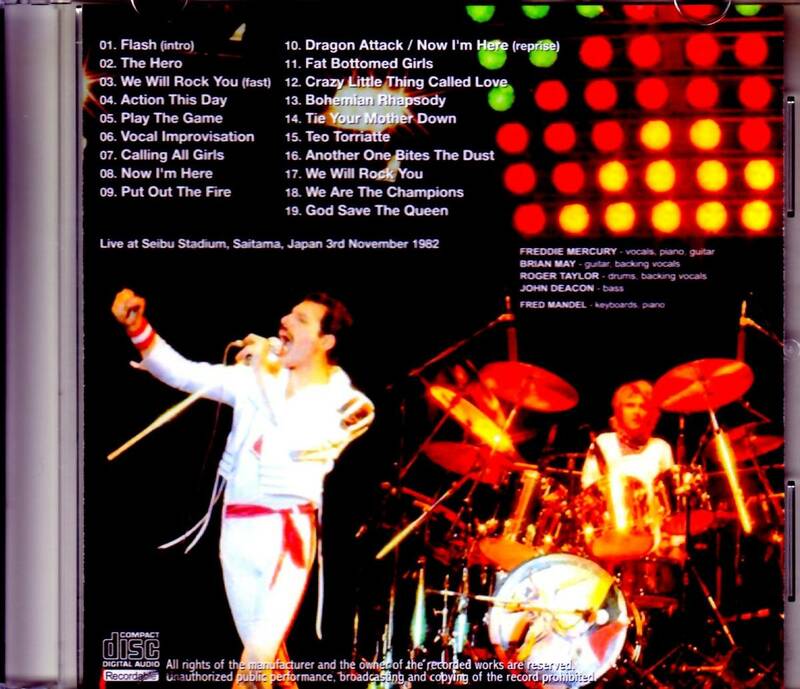 Recorded: Live at Seibu Stadium, Saitama, Japan 3rd November 1982. Comments: Single cdr contains a un-circulated audience recording. 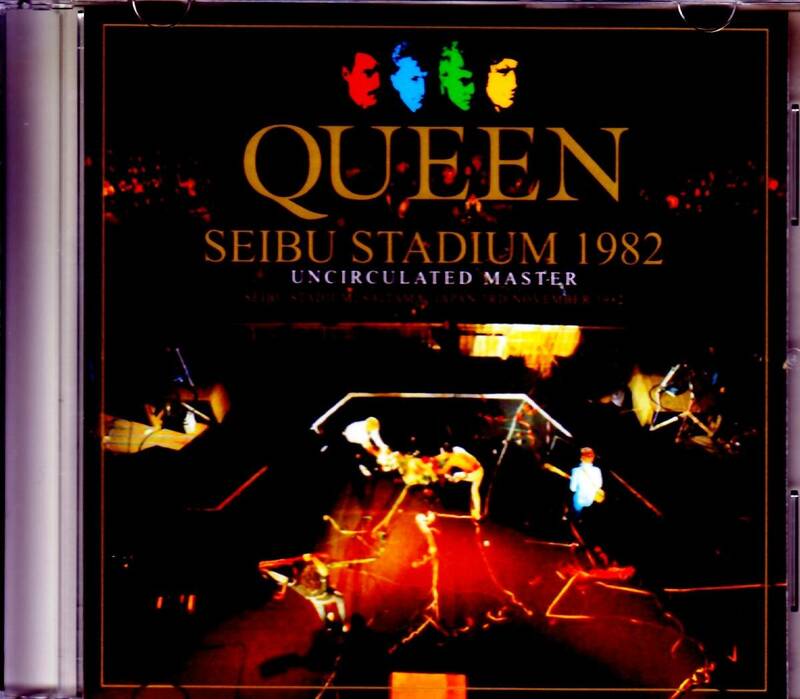 Live album of "Nov. 3 1982 Seibu Stadium Performance". However, it is neither an official sound board as known until now, nor a recording familiar with SPACE BOOGIE. It is an audience recording that will be released for the first time in the world. In the first place, this show had very few audience recordings because the official video was so famous. Therefore, “SPACE BOOGIE”, which tells of the full show on the day, was welcomed, but the audience recording on the day was not only one of them. There has been a masterpiece recording that has not been distributed among collectors. That is this work. The quality is a vintage recording with a wonderful clearness. As expected, I can not expect a core as lonely as "SPACE BOOGIE", but the performance sound and singing voice will be delivered straight to the hands with clear sound only at the Seibu Stadium without a roof that reflects the sound. In addition, the master direct has a superb freshness without dubbing deterioration, and the noise is extremely loud. Even though there is a sense of distance, you can taste the details well. What's even more wonderful is the documentary of those days. It is not as vivid as the “SPACE BOOGIE” master, but it is a very realistic 80's western music fanlike handclap, and the choir and response are also super-realistic in a large chorus, and it can be thrown by Freddie's every move The cheers are also hot. Moreover, the audience's breath is not clear in the open space, and there is a sense of openness. You will be immersed in the huge stadium spectacle. It is such a clear sound, but there is also a wake even though this work has not been distributed. Actually, the middle part of the show is missing. Although the first half contains "Flash", it took about 40 minutes to change the tape with "Dragon Attack / Now I'm Here (reprise)". The recording was resumed from "Fat Bottomed Girls" and has been recorded until the end. In other words, five round songs + guitar solo from "Love Of My Life" to "Under Pressure" are missing. I would like to go further and in fact, only the latter half of this recording has been in the past. However, the first half is the world premiere of genuine. It is unclear whether the middle part was recorded and then the tape was damaged or it was not originally recorded. Anyway, it is all in 78 minutes 12 seconds of this work that exist. Another expression of Seibu Stadium that became clear beyond the time of 37 years. Although it is not perfect recording, it is an excavation of a new and extremely valuable audience recording that no one has ever heard. One of the treasures to be given to collectors and brothers who can not move their fingers anymore with just a large standard pro shot.